Yes, Retaining Walls Can Be Beautiful Too! Home » Landscaping » Yes, Retaining Walls Can Be Beautiful Too! Retaining walls are practical. They keep soil in place around hills, ledges, and so on. But that doesn’t mean they have to be ugly. When designed properly, retaining walls can add a unique style to your property and can even expand your outdoor living space. At Landscape by Design, we are experts in making retaining walls beautiful in Fort Worth and surrounding areas; adding extraordinary elegance to your outdoor décor. 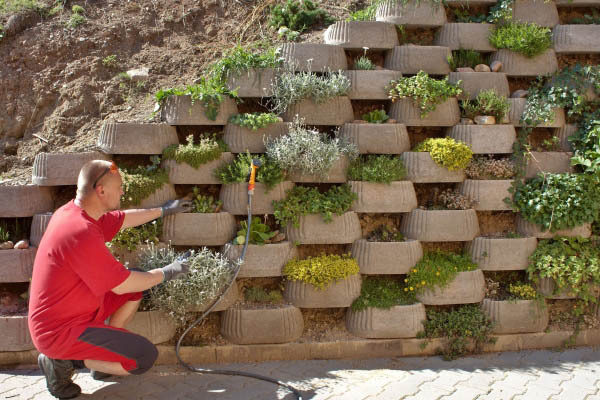 Here are just some of the ways to beautify those retaining walls. Stacked Retaining Walls: for a clean and polished designer look, consider building a stacked wall using tiers of shorter walls. In between the tiers, plant flowers, bushes, or simply grass. Concrete Planter Boxes: offering a textured shadow look, adding concrete planter boxes to the design of the wall is both stylish and a practical use of the wall space. Stone Art: for a more eclectic look, consider gluing different pieces of stone and rock into a masterpiece of design. Sure, retaining walls have a job to do. They keep soil erosion and water infiltration at bay. However, that doesn’t mean they cannot be useful in other ways too. Add to your outdoor living space by using the wall to create more seating, or even a stylish grill area or fire pit. Always dreamed of a sunken courtyard or a raised garden? Use the retaining wall as a way to add these features to your yard. A large cement block wall doesn’t do much to add to your property’s overall look. But, using a stylish stone and adding a curve to the wall can create just the kind of creative element that grabs attention – the right kind of attention. Being creative in your design not only enhances the space but adds a touch of unique flare that showcases your individual style. For a more elegant look, build your retaining wall with enough space to grow some colorful flowers and plants inside. Not only does it make the piece practical, it adds warmth and texture to the design. Depending on where your retaining wall is located, and how large it is, you may want to incorporate some modern lighting aspects. Wall sconces look great on taller walls (6 feet and taller); especially when located near stairs, while spotlights can help to showcase architectural; design at night. You may never have thought about lighting your wall, but remember, working with the color for the stone and shadows can add warmth and sophistication to your space at night too! Whether you want to add a more natural element to your yard design, or you would rather create a sleek modern style, you can use a retaining wall to create the look you are after. Building the wall with wood and adding plenty of natural stone and green grass offers a natural look that works well with garden and sitting areas. Wide wooden planked walls also offer a more peaceful and serene setting, while congruent shapes and colorful stone adds a vintage appeal that accentuates the landscaping and architectural details of older homes. If your retaining wall seems to take over your property, consider adding some pathways to help make it less of an intruding presence. Carefully selected paths and steps situated around the wall will create the look and feel of a sophisticated design. Why let a retaining wall detract from your beautiful landscaping? Use it to enhance the setting instead! Spruce up that wall by adding a water feature like a pond or waterfall! Trying to hide that retaining wall may only make it more noticeable. But, using it as a focal point can help you incorporate it into the overall design, making it the centerpiece of your entire yard. When it comes to building the kind of stylish retaining wall that adds to your overall landscape design, it is important to bring in a crew of experts that know how to design and construct exactly what you are looking for. Find out how Landscape by Design can help by calling for your free consultation today.